August 10, 2018 at 12:09a.m. A tipped Joe Craycraft pass ended in the hands of Youngstown State nickel Avery Larkin, then linebacker Curtis Parks came up with a fumbled ball on the next play. On the third try at a successful play by the Penguins’ reserve offense, the ball made its way to Cardinal Mooney graduate Ray Anderson — another linebacker via a fumble — and practice was put on pause. It was time for the offense do some extra pushups and for the defense to celebrate. Just to ensure that Thursday’s practice belonged to the defense, it blocked Zak Kennedy’s end-of-practice field goal try. Freshman Grant Gonya was given a chance to bail out the offense with another try, but the kick went wide right, prompting additional punishment in the form of “six inches,” a workout where players lay flat and hold their feet six inches above the ground. Head coach Bo Pelini was forgiving of his reserve offense, citing their youth. “You don’t want to see it at any time, but I thought it was a good day period for both sides,” Pelini said. “I thought the offense got the best of the defense yesterday and today, I thought it was good competition. 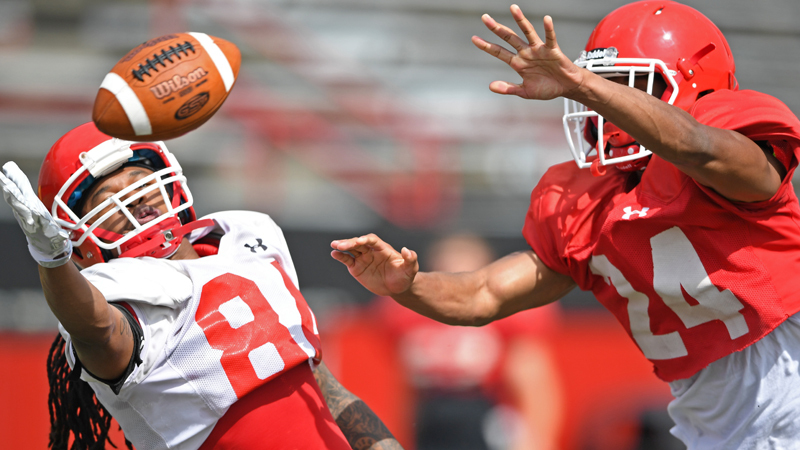 YSU’s secondary has taken a hit this offseason with the graduation of safety Jalyn Powell and the replacement for the Warren Harding grad, senior Deshon Taylor, is currently not practicing with back issues. Pelini has shifted players around to try and find a guy to pair with junior Kyle Hegedus. Seniors Crispin Lee and Larkin have had reps at safety even though both have been cornerbacks during their time at YSU. Both have impressed. Lee has been a reserve defense and special teams player in previous seasons. Like Lee, Larkin is picking up the safety position in addition to working as a nickel. He started six games last year, grabbing an interception. Both will have jobs in the fall regardless of how the safety position battle plays out. Each can play nickel, with cornerbacks Bryce Gibson and DJ Smalls returning as starters on the outside. YSU was the Missouri Valley Football Conference’s best defense against the pass, giving up just 143.7 passing yards per game. Another player who’s done well filling in for a graduated player is junior Cash Mitchell at linebacker, taking the place of Lee Wright. Mitchell got on the field for the first time last year, getting 15 tackles in nine appearances. As the players were doing their final stretches on the field, another crew was getting to work. Workers have already started assembling the staging area for Saturday’s Florida Georgia Line concert at Stambaugh Stadium. The concert pushes the football team to the WATTS on Friday and to Austintown Fitch High School on Saturday. October 24, 2018 12:08 a.m.
April 8, 2017 12:10 a.m.
March 27, 2018 12:25 a.m.